New York Times bestselling author Margaret George captures history’s most enthralling queen-as she confronts rivals to her throne and to her heart. One of today’s premier historical novelists, Margaret George dazzles here as she tackles her most difficult subject yet: the legendary Elizabeth Tudor, queen of enigma-the Virgin Queen who had many suitors, the victor of the Armada who hated war; the gorgeously attired, jewel- bedecked woman who pinched pennies. England’s greatest monarch has baffled and intrigued the world for centuries. But what was she really like? In this novel, her flame-haired, lookalike cousin, Lettice Knollys, thinks she knows all too well. Elizabeth’s rival for the love of Robert Dudley, Earl of Leicester, and mother to the Earl of Essex, the mercurial nobleman who challenged Elizabeth’s throne, Lettice had been intertwined with Elizabeth since childhood. 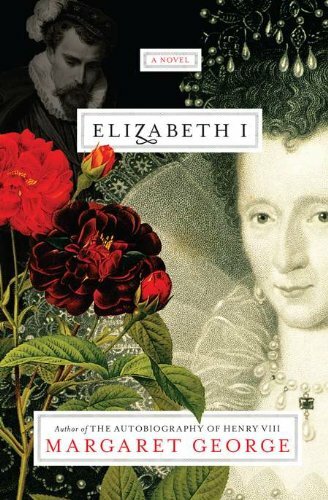 This is a story of two women of fierce intellect and desire, one trying to protect her country, and throne, the other trying to regain power and position for her family and each vying to convince the reader of her own private vision of the truth about Elizabeth’s character. Their gripping drama is acted out at the height of the flowering of the Elizabethan age. Shakespeare, Marlowe, Dudley, Raleigh, Drake-all of them swirl through these pages as they swirled through the court and on the high seas. So there I was, randomly browsing Amazon this weekend and came across this title and author. I almost didn’t believe it! It’s been years since Helen of Troy and I knew she was working on this book, but had no idea it was due to come out! And the author’s going on tour, but sadly, nowhere near me. Either way, very excited for this release! i hadn’t heard of this one! she seems really popular right now! I haven’t read anything by this author but mentioning Helen of Troy and this book got my attention so I put all her books on my to buy list.